A scientist using NASA's Chandra X-ray Observatory has found evidence that two white dwarf stars are orbiting each other in a death grip, destined to merge. 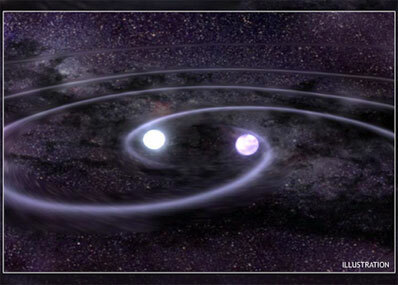 Einstein's General Theory of Relativity predicted a binary star system should emit gravitational waves that rush away at the speed of light and cause the stars to move closer together. As the stars move closer together, the orbital period decreases, and it can be measured by Chandra. The orbital period of this system is decreasing by 1.2 milliseconds every year. This is a rate consistent with the theory that predicted loss of energy due to gravitational waves. "If confirmed, J0806 could be one of the brightest sources of gravitational waves in our galaxy," said Tod Strohmayer of NASA's Goddard Space Flight Center, Greenbelt, Md. He presented data at the American Astronomical Society meeting in Minneapolis. "It could be among the first to be directly detected with an upcoming space mission called LISA, the Laser Interferometer Space Antenna," he added. "It's either the most compact binary known or one of the most unusual systems we've ever seen. Either way it's got a great story to tell," Strohmayer said. Strohmayer's Chandra X-ray observations tighten orbital decay estimates made through optical independent observations by other research teams. Strohmayer's data will be published in an upcoming issue of The Astrophysical Journal. NASA's Marshall Space Flight Center, Huntsville, Ala., manages the Chandra program for NASA's Science Mission Directorate. The Smithsonian Astrophysical Observatory controls science and flight operations from the Chandra X-ray Center in Cambridge, Mass.